Elop Interview – Swipe UI will live on; great progress with US carriers; Swipe Tablet? 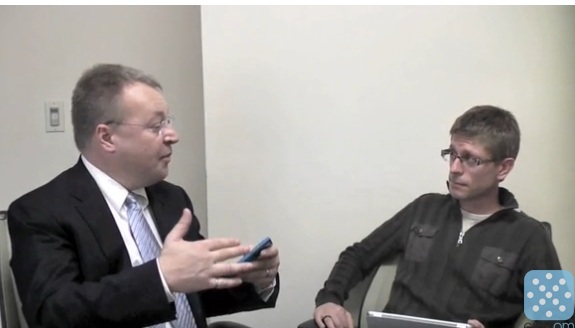 Here’s a really interesting video interview of Stephen Elop by GigaOM’s Kevin C. Toefel. I’ve mixed up my own commentary with what’s said in the video. Nokia going to the US in early 2012. Elop clarifies that this implies the discussions have gone VERY well – “we’ve made great progress”. So, full carrier support with Verizon? AT&T? Elop says (And Kevin agrees) that the US is a very different market so Nokia is taking even greater steps to deliver unique products, unique business models and approaches for the US market (hopefully meaning full force flagships as US would probably prefer the whole shock and awe, WOW comeback rather than something that gradually warms up). On the 800 – Elop says that just shows the very first examples of how Nokia intends to differentiate. We will keep reiterating this across several posts – this is 8xx series. Nokia has said they will put their stamp on next year. Consider based on Nokia’s past, how remarkable it is to have a phone within 8 months of conception to be announced and shipping? Wait for the 9xx to really judge what Nokia can do. “You will see it blossom and move forward from there”. What we will see is Nokia apparently influencing Windows Phone and doing things uniquely themselves that expands over time. What ifs – Android 18 months ago? Kevin asks a provocative question – not simply should Nokia have gone Android – but could they have gone with Android if it was proposed 18 months ago? (Without listening to the answer, 18 months ago, any other OS was completely out of the question. Maemo 5 was extremely darn promising. Who knew they were gonna mess that up by folding it into MeeGo and slowing development of Maemo 6 which would have otherwise been out in 2010, huh?). Timing is indeed key, how things played out provided Nokia different set of options that would best serve Nokia. What’s going on with N9 – Why release it and (effectively) not sell it? Kevin says there’s been excellent response to N9, he played with it for half an hour and was super impressed. More so than anything he’d ever seen on Symbian (well, that’s not exactly difficult, but we get his point). Elop retorts that Nokia are selling it and that’s good. Well short and sweet. Perhaps Kevin should have been more specific in the limited availability. Business wise perhaps it’s clear Nokia doesn’t want to confuse customers who see the beautiful N9/800 but both having different interfaces (especially what with NokiaWP being the immediate future of Nokia, the thing to be scrutinized the most). Elop repeats that elements in the N9 which we’ve all liked (e.g.Swipe UI) will live on. Marko Ahtisaari gave a talk on this – remember the implication of Swipe on S40/Meltemi? He says it’s less about the underlying platform, but more on the industrial design. As an example, the 800 is apparently a refined industrial design from N9. Manufacturing processes have evolved since N9, now knowing how to do it in large volumes – because of N9. Qt will be key to Nokia and the next billion (especially as an app platform)… Again Elop’s pretty much saying Swipe, Qt, Next Billion. Elop says Nokia will have to be very crisp on the platforms Nokia will focus on. “We need to be very laser focused to ensure success”. Is this effectively suggesting just WP and S40/meltemi (with Swipe/Qt) etc? Kevin reminds us of Nokia’s past experience making a Windows device – the Nokia Booklet 3G (extremely premium, many saying it felt like an Apple device – in a good way, not like Samsung’s photocopy series). Kevin asks what Nokia could bring to a Windows tablet. Elop replies that we’re all seeking to learn how they play and interoperate with mobility. Is it desktop coming down or phone coming up? One of the things Nokia things is important (with Windows 8) it’s the operating environment seen in the Nokia Lumia 710/800 etc expanded – or supercharged as he once put it. Hundreds of Millions will see Windows 8 – so they’ll also understand the Nokia Lumia by default which is helpful. But that also suggests opportunity for interoperability between the different platforms that really brings together people’s Digital Experience. This isn’t just between phone or tablet but also the traditional/formal PC, cars, gaming console (i.e. Xbox :p). Our favourite word comes in. ECOSYSTEM. The definition he says is expanding not just to mobile device but to the other platforms. Nokia therefore would have a lot of ways to participate and differentiate within that. However, when asked whether the partnership stated the use of Win8 for tablets, Elop says it’s only just for smartphones. Nothing else has been announced at this point. Does Nokia want its own OS (like it once had). Hmm, they still do, albeit 2 out of 3 with shelf lives, S40 still strong, as is effectively Qt. You’ll hear a low battery tone at this part. Lol. Anyway, Elop recognizes the different price points Nokia targets. There’s a huge opportunity still in emerging markets at very much lower price points. He notes that there’s a certain price point where you cannot take the smartphone experience (holding a Lumia 710). Some things have to be sacrificed – screen size, memory, processor etc. Remember before Microsoft has stated aims for sub 100 dollar Windows Phone – they note the quality of experience there actually will not be sacrificed. Resolution will remain the same even at the cheapest sub 100USD WP. However, Nokia does phones you can buy with pocket change that’s actually pretty decent (S30, basic S40). Wow, ok that’s a lot of text. I had no idea how long the actual video was. I was far away from the screen and just saw it as 7 minutes, not 17. Cheers Jim and Rohan for the tip! « Video: Plasma Active on N950 on Mer core.